Read What our Customers Say.. I have been following Jeff’s OMEP customized eating plan for the past five months and I look and feel better than I ever have in my life. About 5 months ago, I was struggling to get off the baby weight from my 3rd child, (I have 3 children under the age of 4) and the summertime was rapidly approaching, so I knew I had to do something. I was logging countless hours at the gym and eating what I thought was healthy food, but it wasn’t working, the fat wasn’t budging. I found Jeff’s website and decided to go for the OMEP because it was customized exactly to me and my needs. It was the best decision I have ever made in regards to my health and physical appearance. Within the first month I lost 2″ off my waist and 6 lbs of fat, and the fat continues to melt off while still building muscle! The food is delicious and there is plenty of it! All I have to do is follow my program! Jeff is always available to answer questions and lend his support and I feel as though he genuinely cares about your success! I recommend this program to everyone I meet who is looking to make positive, lasting changes to their overall health, wellness and appearance! I love this program and will continue with this lifestyle because I know it works! Thanks Jeff!! Over the last 7 months that I have been working with Jeff, I have gone through not only a physical transformation but a mental one as well. I have always been “into” fitness. I bought all of the fitness magazines and read everything I could get my hands on that would help me get the body I wanted. Working out for me was never the issue; I loved working hard in the gym. My problem was I was over training and eating the wrong food. I was an out of control calorie counter. I would keep myself at a 1500 calorie diet full of string cheese, instant oatmeal, yogurt, packaged meats, and frozen meals. Then I started reading Jeff’s articles and my mindset started to change. I started to eat whole organic foods and adding in more fats. Then I saw some of the results his clients were getting. Even thought I was getting some results by just reading his articles and applying his principles I wanted to see what it was like to actually work with him. That was 7 months ago when I was 192lbs and 33% body fat. I am now 137lbs and 17.5% body fat and I have never felt better. I have lost 5 inches from my waist and 7″ from my hips. I even lost 4″ from my arms! Jeff gave me a plan that was easy to follow and took all the guesswork out of the diet and the workouts were brutal but beyond effective and much less time in the gym than I was doing before. Best of all was the support I had in Jeff. He was always there when I had a question or to congratulate me on an accomplishment. I just recently went through a huge rough patch in my life and the stress was actually causing me to gain weight! I talked to Jeff about it and with his support and encouragement we got me on the right path and over the last month and a half I lost 15 more lbs. I know for a fact I could have never done this without Jeff and it was well worth the investment to finally be able to look in the mirror and love the way I look. Thank you Jeff! Before coming to Jeff, I struggled for at least two years trying to find the diet and workout program that would help me to lose fat and get into shape. Almost every month I was fruitlessly trying something new in hopes of losing at least 5 lbs of the 20 lbs I had gained. Nothing worked. I thought the more extreme the better – so I tried everything from running over 40 miles a week to Crossfit to insane protein-powder-only diets to eventually trying to starve myself. My results were all the same – fat GAIN. The more the numbers on the scale went up, the more hopeless, insecure, and lost I felt. I even began to believe I had a medical condition prohibiting me from losing fat. So after trying to get into shape on my own, I decided to pull up Jeff’s site on the web to check out his rates. I had previously read articles written from him, and amongst all the different diet and exercise websites I read through, his articles always seemed to be my go-to. His articles and webinars had already developed the trust that he knew what he was doing, so I signed up. After signing up with him and FINALLY losing the 5 lbs. I had struggled so bad to lose, I knew that I had finally chosen the right path to achieving my goals. Two years later I’m still with Jeff and making amazing progress month-by-month. I’ve gone from a 30″ waist to a 25″ waist, 141 lbs to 126 lbs, and 23% body fat to 13% body fat. Every month whenever I’m filling out my evaluation for him, I always have a moment when I check-out my progress and think to myself. “I could have NEVER done this on my own!” The most common thing friends and family ask me is, “Don’t you think you can write out plans for yourself by now?” Absolutely not! I always tell them that just because I know math doesn’t mean I can waltz up and do an accounting’s job. Yes, I understand some fundamentals to dieting and working out, but my knowledge and expertise doesn’t even come close to matching Jeff’s. Thinking I can do what he does would be sheer arrogance on my part. Some other things people are always asking me are, “How much longer are you going to follow those programs?” and “You lost the weight – why are you still dieting? ?” Questions like these always lead to me to wondering why people would think I’m ready to settle. Yes, I’ve met my goal – but this is just the beginning! One thing being with the programs has taught me is that the more you put into them, the more they give back. My mission is to go beyond my goals! I never even imagined coming this far – why in the hell stop now when every month my progress gets better and better? Plus, the programs have become a lifestyle to me. Most people consider the terms “diet” and “working out” as chores – I consider them a joy. Through the hardest of times, it was the structure of my programs that kept my head straight. So aside from progress, what am I the most pleased with? I’m beyond AMAZED at the strong mentality and confidence the program’s and wolfpack have helped me develop. I used to be so insecure…I hated attention and I would hide in huge clothes. Nowadays, I would gladly strut around in a bikini (or even my birthday suit!) anywhere I go! And I absolutely embrace the attention I get from strangers and friends. I was a quiet, shy follower all my life…always trying to hide in the crowd, but nowadays with the confidence I’ve gained I fight to be a leader! I’m now living life every single day without any holdbacks – and THAT is the most amazing and beautiful feeling ever! While following the OMEP and transitioning into the Victory Phase I never craved anything. I wasn’t hungry and always seemed to have energy. The workouts were fun and I never felt run down or over trained but of course I have been following Wet Wolf since 2008 so I have had many opportunities to educate myself by reading his articles and becoming familiar with his work through his website and journals. Everything I needed to be successful could be found on his site or on his YouTube page. You still have to do the work and be consistent but he will give you the right map to get it done. My meals consisted of foods that I listed as preferred and if something was given to me that I didn’t like Jeff would always be willing to accommodate. I have learned so much by following his programs like portion sizes and appropriate foods to eat. I’ve learned that I’m not going to die if I don’t get my chocolate cake after dinner. The end result is worth the temporary sacrifice. Now that I’m at a happy weight and able to make my own food choices I don’t run to grab the tastiest junk food I can find, I don’t even want it now. Working with Jeff not only changed my outside appearance but he helped change me from the inside as well. 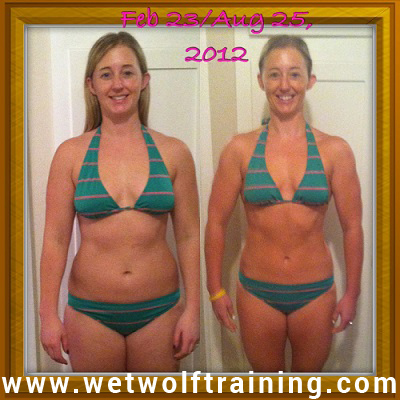 I no longer have an unhealthy relationship with food thanks to Wet Wolf Training.